Stave Hill again hosts the hub for this 4th iteration of Reveil, a collaborative daybreak broadcast looping the earth on International Dawn Chorus Day on live audio streams. Stave Hill is the direct successor to the temporary William Curtis Ecology Park, set up by Tower Bridge in 1976 as perhaps the world's first urban ecology park. Established in 1986 on rubble infill in the ruins of the world's largest port, Stave Hill has become a site of exceptional biodiversity in the inner city and a testing site for community based urban ecology over 30 years. Sounds of Spring overlay songs of resident birds such as blackbirds, woodpigeons and wrens, with recent arrivals from Eastern Africa and Southern Europe: Chiff-chaffs, Willow warblers, Blackcaps, Lesser Whitethroats. The list includes rarities: last year Geoff Sample identified a Grasshopper warbler and the previous year we heard a nightingale. 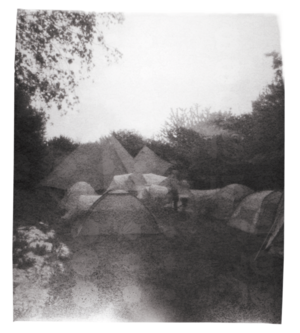 The soundcamp is a chance to sleep outdoors in the Stave Hill meadow and take part in workshops, walks and performances with artist, naturalists and other listeners. The Reveil broadcast runs from 5AM London time (UTC+1) on Saturday 6 May to 6AM on Sunday. It is broadcast to soundtents on site over low power FM and covered in full by Resonance Extra, in part by Resonance Radio, and in full or in part by participating FM and net radio stations. See the website for a full list. The primary Reveil stream is hosted by Wave Farm, our US broadcast partners in Acra, Upper Hudson, NY. Reveil is made possible in large part by Locus Sonus at the Hautes École d'Art of Aix en Provence, as well as independent projects, the Cyberforest programme at the University of Tokyo, and the many streamers who share the sounds of their locations just ahead of sunrise.